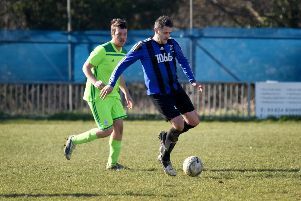 Hastings United Football Club produced a rousing a second half fightback to earn its first league draw of the season. Chris Agutter’s side recovered from 2-0 down at half time to draw 2-2 away to Faversham Town today (Saturday) with goals from Daniel Ajakaiye and Jack Dixon. Hastings remain second in the Bostik League South East Division - six points behind leaders Cray Wanderers having played the same number of matches. Cray weren’t in action today. This was the proverbial game of two halves. In the first half Hastings produced lots of effort and nice passing, but struggled to carve out chances and kept getting caught by balls chipped over their defence. Hastings fell behind in such fashion after only five minutes. Ben Chapman got on the end of a ball over the away defence, raced through and scored. Antonio Walker had a couple of attempts at goal during a decent Hastings spell, but Faversham doubled their advantage in the 26th minute with a very similar goal to their opener. This time Ashley Miller was the scorer. Hastings replaced Jamie Fielding, who was on a yellow card with Emmanuel Mensah, and would have been further behind had Miller not shot wide when it seemed easier to score. The visitors were excellent in the second half and produced some of their best football of the season. Ajakaiye halved their deficit with his 23rd goal of the season in the 48th minute. Hastings were very much back in it and they forced corner after corner with Youssouf Bamba causing all sorts of problems for the Faversham defence. Ajakaiye and Dixon shot just wide before the equaliser came in the 73rd minute. Bamba sent over an inviting cross and Dixon picked out the far corner with a superb header. The momentum was all with Hastings and it looked like there would only be one winner, but Faversham goalkeeper Will Godmon had other ideas. Godmon firstly produced an outstanding fingertip save to keep out a Sam Adams thunderbolt and after Faversham had Harry Goodger sent-off for a second caution (both for fouls), he got down low to stop Dixon’s close range header to ensure honours ended even. Dixon, Bamba and Ajakaiye were all outstanding for a Hastings side which will also be in action on Tuesday night, away to Whyteleafe. Hastings: Horlock; Fielding (Mensah 34), Howlett-Mundle, Cruttwell, Beale; Ibrahim (Lovatt 67), Dixon, Adams; Walker, Ajakaiye, Bamba. Subs not used: Climpson, Curran, Azeez. Attendance: 228. Bostik League South East Division top half (played-points): 1 Cray Wanderers 13-37 (+22 goal difference), 2 HASTINGS UNITED 13-31 (+21), 3 Phoenix Sports 15-26 (+6), 4 VCD Athletic 14-25 (+4), 5 Hythe Town 13-24 (+7), 6 Haywards Heath Town 14-22 (+4), 7 Ashford United 13-20 (+7), 8 Whyteleafe 12-19 (+6), 9 Horsham 11-19 (+4), 10 Ramsgate 13-19 (+3).